Hi! 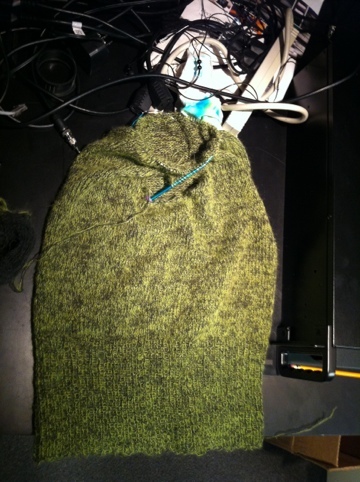 I’ve been working like a fiend behind the scenes on a whole bunch of secret knitting – there’s unfortunately going to be a lot of that in the coming months. I’m doing something akin to building a trousseau in advance of my wedding, only instead of making quilts and table linens and whatnot, I’m making gifts. There are a lot of people in my life to thank this year, and a lot of good friends I want to acknowledge, and of course, there’s presents for my sweetie… so yeah, there’s not going to be much knitting I can show you for a little while. I do have ONE public project, though! 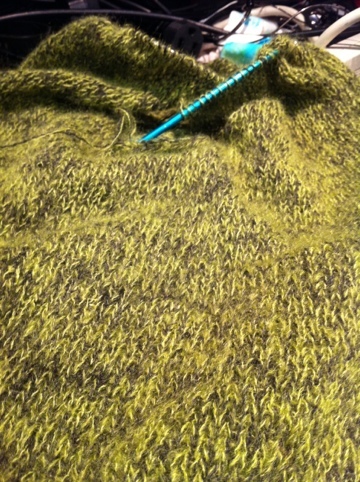 I’m making the #17 Cowl Neck Pullover from the 2011 Holiday issue of Vogue Knitting. I don’t do the projects in VK very often; they tend to be a little over-the-top for me. This one gave me a pretty plain canvas as far as the shape went, and I was able to make it daring with a little color. Don't mind all the electrical cords; I've been reduced to taking photos at work these days. It’s still pretty bright, but I think it’ll be fun. I’m looking forward to wearing it this fall with a long black tank and black skirt. I hope it’ll be just enough to brighten dreary days without being overwhelming! So, what is Erzulia? It’s a made-up holiday that celebrates the six aspects of Erzulie Freda: love, beauty, dancing, jewelry, luxury, and flowers. It begins on the second Monday in February, and continues for six days – one for each aspect. This all began several years ago, when a friend of mine, in a fit of pique, decided that Valentine’s Day was for suckers and she was going to celebrate something she could really get behind. Hallmark hasn’t picked up on this one yet, so we’re spreading the word one blog post at a time. 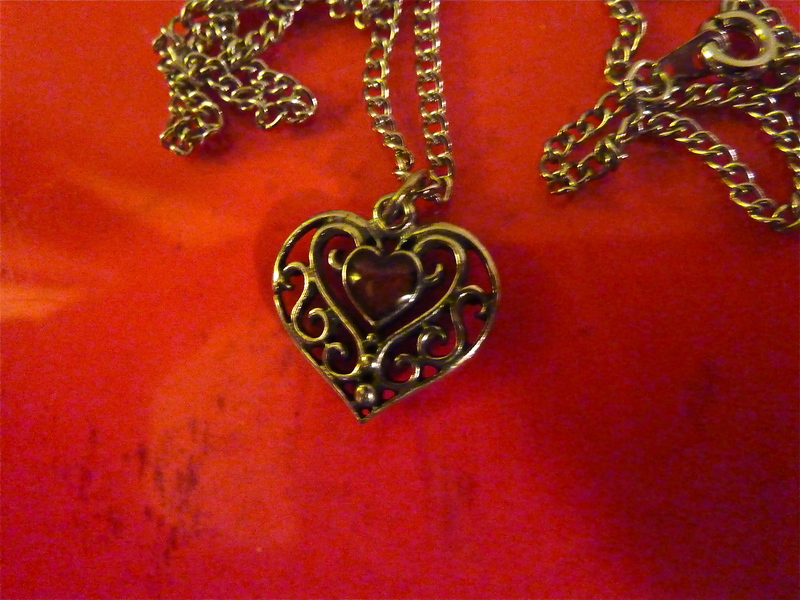 So yesterday was Jewelry day by default. Yay! I’m wearing it today, and it makes me feel all warm and fuzzy. Today we’re celebrating Luxury in a number of ways. First of all, we managed to juggle our busy work schedules this week so that we could spend the whole day together (even tonight, as we’re running the same show). We had lunch at Psycho Suzi’s, our favorite tiki bar and the place we had our first date. Tonight when we get home, we’re planning on watching the last episode of season six of Dr. Who — we’ve been saving it, and we’re both way more excited than we should be. 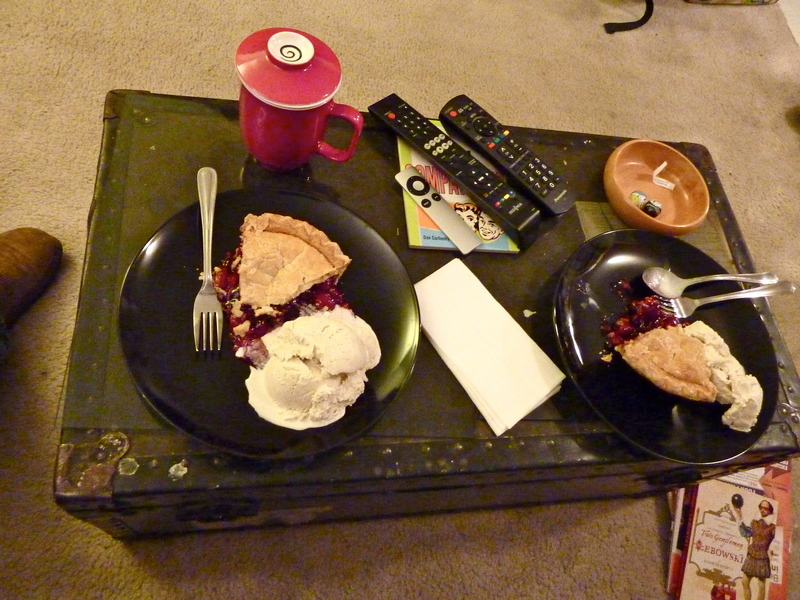 Ryan got pie and Izzy’s ice cream, and we’re going to enjoy a quiet evening at home with each other and the kitties. Stay tuned for the rest of the week. I’ll keep listing our little celebrations and more fun facts about Erzulie. Feel free to join in – the more the merrier! Leave me a comment telling me which aspect you’re celebrating each day, and how.